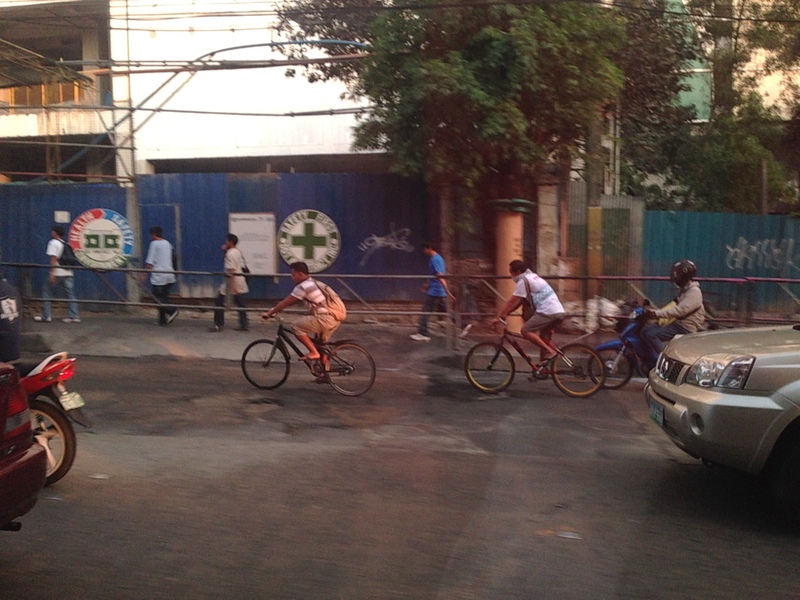 Home » Cycling » “Pwede na yan” bikeways? The recent clamor for bicycle facilities have led to several initiatives in Metro Manila and other Philippines cities (most notable recently is Iloilo) to support the demand for cycling facilities. While Marikina City already has a network of off-street bikeways segregated from motorised traffic, there are few other examples of such facilities elsewhere. The more recent initiatives in Metro Manila involved the Metropolitan Manila Development Authority (MMDA) establishing bikeways in several areas along major roads in the metropolis. I say establish because the MMDA did not construct new bikeways like the ones in Marikina or Iloilo. What the agency did was to designate sidewalks and other existing paths for cycling by painting these over. Unfortunately, these so-called bikeways did not take into consideration the needs of pedestrians with whom cyclists must share this limited space. And so few people use them despite a high profile launch that brought together government officials and NGOs including cycling and mobility advocates and enthusiasts. I guess the big test was really not whether advocates and enthusiasts would really use the bikeways (Don’t count on the officials to use them. They have chauffeur-driven vehicles.). Would the regular commuter use them instead of the roads, despite the risk or dangers posed by motor vehicles? Commuters waiting for a bus ride along EDSA with suspended bicycle racks behind them. The sidewalks along EDSA have been painted red, designating them for bicycle use. The big question now is how cyclists will interact with pedestrians given the very limited space they should be sharing. Bicycles hanging on racks attached to the perimeter wall of an exclusive subdivision along EDSA. Cyclist using the curb side lane of EDSA – these people run the risk of being sideswiped by buses operating along the yellow (bus) lanes of this busy thoroughfare. It is quite obvious in the photo that there is no space on the sidewalks to accommodate cyclists and even pedestrians. Column for the MRT-3 stations are right on the sidewalks and makes one wonder how this flawed design was approved in the first place. MMDA enforcers usually appear as if they are only bystanders and seem to be generally helpless when it comes to managing traffic. Workers cycling back to their homes after a day’s work. Many people have opted to take bicycles for their daily commutes even if they have to travel long distances in order to save money that would otherwise be paid as fares for buses, jeepneys, UV Express or tricycles. Note that the cyclists use the outermost lane of the road as the sidewalks pose many obstacles including pedestrians as shown in the photo. Some cyclists though want more than a share of the sidewalk or a lane of the road for their use regarding pedestrians and motor vehicles as nuisance for them. Surely, some pedestrians also regard cyclists as nuisance to walking and would prefer to have the sidewalks for themselves. Cycling is in a way an emancipation from motorized transport commutes, and savings translate to money they could allocate for other needs of their families. While there are raw data for family expenditures from census surveys, there are few studies and publications focused on transport. It would be interesting to see how much a typical Filipino family spends for transport in absolute terms as well as a percentage of their total incomes. Such information would be essential for understanding the needs of travelers, especially for daily commutes for work and school (other trips include those for purposes of shopping, recreational, social and others). Long commutes are associated with higher expenses (e.g., in terms of fares or fuel costs) and reducing such costs through shorter commutes should free up money for necessities like food, housing and clothing. Ultimately, this would help solve issues relating to poverty and health, which can easily be related to commuting behavior and characteristics. It is in that context that transport systems should be planned and implemented carefully along with the housing developments. This underlines the essence of the relationship between transport and land use that has been the topic of discussions for quite some time now that apparently, a lot of people in this country, especially officials and the private sector have chosen to ignore or apply selectively (i.e., according to their own advantage and not really for the general welfare of the public). A transport system is not cycling alone, or roads or railways alone. It is, by definition, a network, a set of interacting, integrated elements and each of these components of the system are essential for it to function well. It is the interaction and integration that are the key elements that we often forget as we advocate one transport mode over others as if they are independent from each other. They are not and we should complement rather than compete in our advocacies for transport so we can finally achieve an efficient, effective system for everyone. By d0ctrine in Cycling, EST, Governance, Infrastructure, NMT, Pedestrian, Policy, Road Safety, Transport Planning on May 17, 2014 .